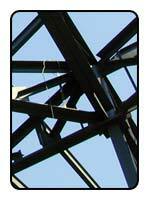 Woolf Steel, Inc. is a family owned and operated structural steel fabrication company. Based in Central Pennsylvania, Woolf Steel has provided steel products and related services to commercial construction projects throughout the Mid-Alantic region for over 80 years. In addition to our steel fabrication products and services, we offer a complete line of steel joists, metal deck, miscellaneous steel products, and steel erection services to complete any structural project. Our company is AISC Certified for Quality Control which assures the products we deliver meet rigorous national standards for quality. Our many years of industry experience enable us to realize even the most complex design requirements, including updated Construction Codes and environmental LEED Certification. Today, the third generation of the Woolf family continues our commitment to providing high-quality structural products on-time and within our customers' budgets.